From the minute you look at them, these cards look and feel old. Even as they left the presses, they probably looked old. Perhaps the wool flannel uniforms that most of the players are wearing, which was only beginning to give way to the double-knit polyester jerseys and pants for which the 1970s are most famous, creates the feeling of old age.1 In 1971 most of the players still wore their hair short, and only the frequent sideburns hint to the long-haired and mustached revolution which was to arrive shortly. But I believe it was the use of black borders, a stark contrast to any previous (or later Topps release in that decade), which gave the cards their antiquated complexion. I was four years old when these cards were printed, and I have no memory of ever buying them in packs. 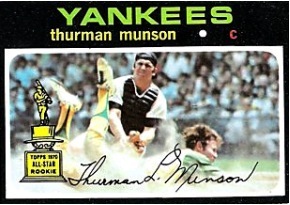 I believe it was during the summer of 1975 when I first saw a couple of these cards at a friend’s house. 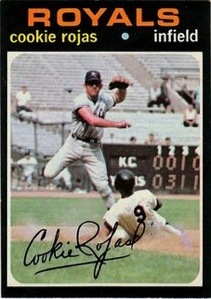 One of those cards was Cookie Rojas—#118 in the set—who was in the process of turning a double play at Yankee Stadium in front of mostly empty seats. I wish I could remember the other card, or cards, but I haven’t been able to find one that sparks a memory like the one I have of Octavio Victor Rojas Rivas, which I have, no doubt, because of his distinctive nickname. As I held the homonymous Cookie in my hand, I immediately thought, These cards look ancient, almost as if I had stumbled upon fossils from a forgotten era in the game. When you’re eight years old, I suppose anything released four years prior (half your age) is at least relatively ancient. And while it may be that by the time I held a 1971 card in my hand I was simply used to the unkempt look of the players in the 1975 set—the well-groomed players from 1971 might as well have been from 1871, as far as I was concerned—it was the presence of the black borders which gave the cards a starkly vintage appearance. Once again, I was probably used to the wildly colored borders of the 1975 set. And because the black borders are famous for chipping, particularly in the hands of the intended market—grade-school boys—the card I held must have looked especially weathered. In addition to marveling at the old appearance of the cards, I was also struck with curiosity. These cards had been printed before I started collecting; this was first concrete sign that the world did not revolve around me, and this realization must have been unsettling. I’m sure I wondered what cards before 1971 looked like. Surely if 1971 cards looked old, anything before that year must have been nearly primitive. Because there was no internet and the embryonic hobby of card collecting was unknown to me, I simply had no way to investigate past cards. If Topps’ innovations were radical, I was unaware because I had no real reference point with which to compare these cards, other than successor issues. These cards are far enough removed from the contrived scarcity and designs of present day card releases to have retained a quaint innocence, which many of us long for, as our cynicism often grows with age. Perhaps James Earl Jones’ character in “Field of Dreams” was prophetic when he romanticized the nostalgia of baseball as providing a direct connection to our collective and ethereal youth. That’s how I feel when I look at my 1971 Topps cards—unencumbered and somehow optimistic. More “hobby aware,” I began putting the set together, card by card, in 1983. I initially bought 300 different cards from a West coast dealer for around $30. The remaining 452 cards took me another seven years to find, as the black-bordered pasteboards became my white whale. In my determination, I dragged my mother to flea markets and card shows in the Roanoke, Virginia area, where I bought overpriced, dog-eared 1971 cards from chain-smoking reprobates in folding chairs, who muttered about the government. I finally harpooned the set on January 27, 1990—my birthday—when I purchased two cards (#580 Tony Perez and #600 Willie Mays) at a card show in Silver Spring, Maryland. While my set was complete, it was not in acceptable condition. In the fall of 1991, desperately needing rent money, I attempted to sell the cards to a dealer in Richmond, Virginia; he coldly commented that he wasn’t interested in giving me more than $50 because of the overall poor condition of the cards. If I had sold the set, for a huge financial loss (after spending seven years putting it together), I might have gotten out of the hobby entirely, and I’m sure that I would have sold a connection to my youth cheaply. Instead, I walked out of his shop with the album of cards under my arm—the bell ringing loudly behind me—and ended up putting the set together again. By 1998 I had moved to Birmingham, Alabama, and had relocated my entire card collection from Virginia. Over the next two years I upgraded almost the entire set, which is now in excellent-to-mint condition. I like to pull the album off the shelf and browse through the cards from time to time. Cookie, Doc and Thurman are still young, and so am I.
Jeb Stewart is a lawyer in Birmingham, Alabama, who enjoys taking his two sons to the Rickwood Classic each year and buying them cards. He spent most of his youth pitching a tennis ball against his front porch steps, in hopes that a Yankees’ scout would happen by and discover him. Although he remains undiscovered, he still has a passion for the Yankees and collecting baseball cards. Cool story, and very well written! August 16, 1970, Yankees vs Royals. Yankees won 5-1, Stan Bahnsen pitched a complete game victory. That picture was taken in the bottom of the 6th inning. The Yankee sliding was #9, Ron Woods, and it was the start of a 6-4-3 DP, started by a grounder to short by our very own Gene “Stick” Michael. Attendance that day was 13,200– for a Sunday afternoon game in the middle of August, how times have changed! I have that set complete also.My last card I believe was Nolan Ryan.The scarcity of stars in the last series is due to Topps trying to get traded players in their new uniforms so if someone was traded they would be pulled from the earlier series until a picture with their new team could be obtained.Also explains the lack of action shots from the last series. Great comments guys. Steve, that's pretty cool how you figured out the exact date of the game on Cookie's card. Joe, I didn't know that about the traded players. I always figured Topps had lost interest in the cards and produced them out of obligation. Thanks, Savoy. if I recall, the backs of the cards only included the player's previous season stats, and his career stats. I remember feeling a bit cheated, as I liked tracing each player's career trajectory season by season. And what a contrast the psychedelic 1972 design was! Thanks for a great post, though I had almost a 180-degree opposite reaction to these cards when I first saw them. I turned 7 the year the 1971 set came out and, at the time, they seemed very modern and avant-garde to me with the black borders and the names in all lower-case letters. The photos and team names were also a lot more colorful than the drab, gray 1970 cards. I grew up in the Washington, D.C. area and this was the last set with Senators cards, so there has always been a wistful quality to this set for me. Notice that almost every one of the action cards was was shot in Yankee Stadium or Shea Stadium, with the exception of one or two in Connie Mack or Shibe Park or whatever the pre-Vet stadium was last called in Philadelphia. The Bud Harrelson card has a photo with Nolan Ryan in it and the Chris Short card (taken in Philadelphia) has Pete Rose in the background leading off second base. I completed this set and the psychedelic 1972 issue around 1980 and they remain two of my all-time favorites. The '71's were the first set I ordered directly from Topp's. They were $12.50 if memory serves. I ordered complete sets later which came all at once, but the '71's were delivered in series - it took all summer to get them all. I was in Little League at the time and it wasn't unusual for BB cards to be carried in one's back pocket - a definite mistake with this series. If you did ANYTHING to these cards the black border was damaged and they looked terrible. I remember not even wanting to touch mine because they were so perfect. Still have them. Using eBay, it took me 3 years to build the set. I was very choosy, so I can say in confidence the entire set is in NRMINT condition. Sharp corners, no border scratches, centering (which has been MOST important with me) all great. At first I used an album, but switched to a super box with each card in it's own sleeve and top-loader. Sorry to gush (or brag!) but I REALLY love the set and am a bit proud in being able to have done it. Now I am working on the 1970 set! I've been putting this set together little by little for 10 years - and I was born in 1987. I loved the photography and the black borders as a kid. My goal has always been to get all cards in any condition and then replace them little by little. I have a lot with soft corners, writing on the back, creases, etc. I have had many opportunities to complete the set but didn't want to spend the money all at one time and, more importantly, didn't want to end my fun. I found a guy at a card show with multiples of every card from the set. It could have been over, but I'd not have had a set to work on from that point forward. So now, I pick up a few cards here and there. It's much more fun that way! I completed 1-200 from that guy, and have many of the high number SPs and stars. The '71 set was my first real collecting set -- I probably have a couple hundred. I went in whole-hog for '72 and '73, and the '73 set is my personal white whale; I've got <100 to go. If I had to sum up '71: loved the fronts, not crazy about the backs. During the summer of 1971, I was 12 and during that summer, my little league friends and me use to take our allowance ($1 per week each friday) and use to meet up at a corner of a certain neighborhood on saturday morning waiting for a bike ride to the local market to bust packs. This took place in central California and we were all a Giants fan. I recall for the majority of that summer, we took our $1 and bought 5-6 packs of cards, pack of sunflower seeds and a soda. We were after that elusive Topps Willie Mays card. Recall as we were looking over each others' shoulders while someone busts their packs, we had flashes of excitement when we saw the team "GIANTS" on the top of the card, thinking it was Willie Mays but often it was Willie McCovey. Sad to say, the entire summer we never saw a Willie Mays. It was some 14 years later, after college and during my 3 years as a nuke submariner, that I saw #600 at a Navy Base card show. I finally bought my #600 in 1998....27 years later. Great story! I also have one of my own. 1971 I was 10 yrs old. My older brother & I would buy packs of cards at a time for 10 cents with gum & a topps coin inside, what a deal. My friends & I would trade cards, well I put them into a box & just forgot about them. In 2005 I was going through my stuff & came across them, so I decided to complete the set. I needed about 60 cards, after about a couple of years I was down to my last card. This was a very hard card to find, card # 559 the N.L. future rookie, well I finally found it, I think it was about $1.64. It was really fun to complete this set. Now I only need 4 cards to complete the 1970 Topps Baseball set.